BART Silicon Valley Phase II is an extension of the regional BART system that will further expand the system from the nearly completed Berryessa Station in northeast San Jose and add three stations in San Jose and an end-of-line station in Santa Clara. VTA is the designer, funding agency, and builder of BART Silicon Valley; BART will operate the system once built. VTA and BART entered into a comprehensive agreement in 2001, relating to the design, construction, operation and maintenance of the BART extension in Santa Clara County. The project is currently in the state and federal environmental analysis process and is on track to receive the final federal environmental clearance in March 2018 to deliver the project by 2026. The $4.7 billion project will be funded through a combination of local, state and federal funding. 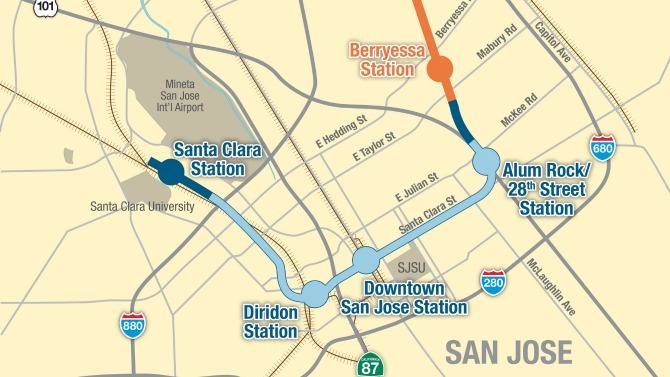 Once completed, VTA’s BART Silicon Valley Extension will extend 6 miles from the future Berryessa/North San Jose Station, through San Jose and into Santa Clara.